In 1902 developers J. E. and A. L. Pennock began construction of a luxurious hotel in the bustling Times Square area on the site of the John Jacob Astor IV's Hotel St. Cloud. 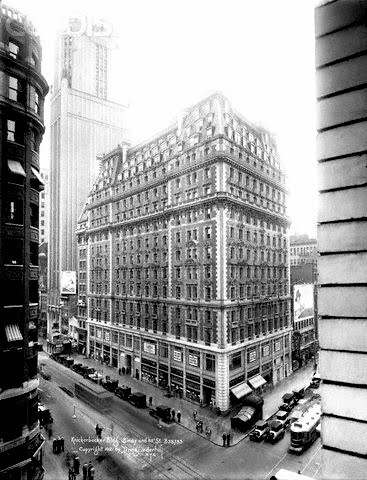 Astor, who owned the land at Broadway and 41st Street, stipulated that any hotel replacing the St. Cloud must cost no less than $2 million. Designed by architects Bruce Price and Marvin & Davis it would be a mansarded Beaux Arts confection of red brick and white limestone with terra cotta ornament. A year after construction started the developers began in-fighting, resulting in the resignation of the director and causing Astor to take over the project. Astor, who had built the famous Astoria Hotel in 1897, retained architects Trowbridge & Livingston to design the interiors. They added a visually-staggering three-story restaurant and bar modeled after the Chateau de Fontainebleau that could comfortably seat 2000 patrons. The space included two electrified fountains designed by sculptor Frederick MacMonnies. 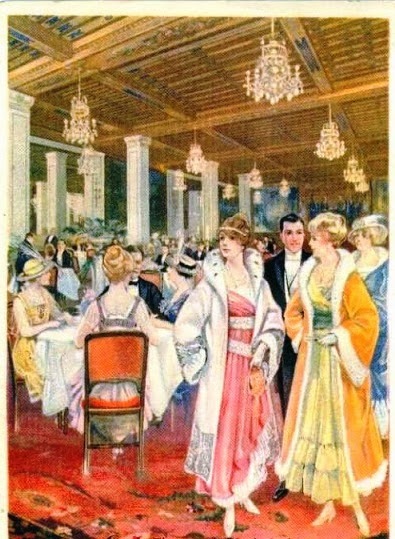 A 1916 postcard is entitled "After the Theatre at the Knickerbocker"
For the restaurant Astor commissioned Maxfield Parrish to paint a 30-foot long mural, “Old King Cole and His Fiddlers Three,” which “attracted much attention” at the private opening reception, according to The New York Times. Other artworks included the mural, “The United States Cavalry Charge” by Frederic Remington and Charles Finn’s mural “Masque of Flowers” for what was called The Flower Room. 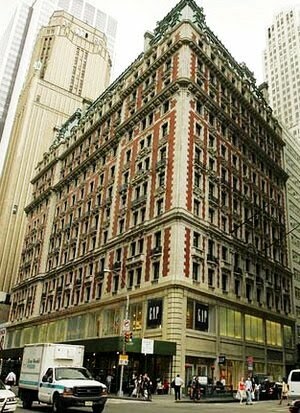 Named "The Knickerbocker," the 556-room, 16-story hotel opened on October 23, 1906. Astor had imported the chef of the Hotel Carlton in London to head the kitchens. The elegant hotel offered rooms for one, with bath, at around $3.25 per night. Six years later John Jacob Astor IV went down with the Titanic, having safely secured his pregnant second wife Madeleine in a lifeboat. His son Vincent (who was a year younger than Madeleine) took over the management of the hotel. Because the hotel was conveniently three blocks from the old Metropolitan Opera House, tenor Enrico Caruso moved in with his family, living there until his death in 1921. His daughter, Gloria, was born in their suite and he reportedly took all of his meals in the hotel restaurant using the same set of silverware. When the announcement came that a peace treaty had been signed between the Allied Forces and Germany in 1918 ending World War I, Caruso threw open the windows of his suite. There below, throngs of New Yorkers crowded the streets. The tenor lead the masses in a spirited National Anthem, followed by the French and Italian anthems. A year after the onset of Prohibition Vincent Astor closed the hotel, retaining architect Charles Platt to convert it to office space. Parrish’s now-famous mural was moved to Astor’s St. Regis Hotel. The grand restaurant was gutted and its fixtures and architectural details sold off. Beginning in 1940 it was the headquarters of Newsweek Magazine and became known as The Newsweek Building. The magazine moved out in 1959. As the 42nd Street area grew seedier, the old Knickerbocker was neglected. The once-elegant interiors became shabby and covered over with pseudo-modern dropped ceilings and paneling. In 1980 it was converted to apartments for a short period although it still housed seamy garment showrooms. When, in 1988, the building was threatened with destruction the New York City Landmarks Preservation Commission designated it a landmark. In 1998 a $14.6 million restoration of the façade, upgrading of elevators and air conditioning systems, and a redesign of the lobby was initiated by STL Green who bought the property for $63.3 million. In March of 2010 Ashkenazy, Crown Acquisitions and Highgate Holdings purchased the property, previously owned by the royal family of Dubai for about $170 million; a substantial decrease from the $300 million price tag in 2006. The new owners intend to renovate it into a boutique hotel with retail space. 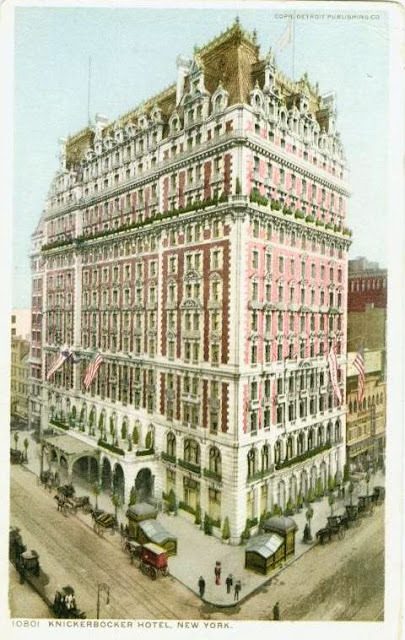 The exterior of the first two floors of The Knickerbocker Hotel have been ravaged over the decades, however the upper floors are remarkably intact. As renovation proceeds, the grandeur of John Jacob Astor’s hotel may stir once again.